February: a month marketed for celebrating romantic love. As for me, I was celebrating the love present in all aspects of my life, from my family, friends, and self. It also was Oscars season, celebrating the richness of the complexities of humanity. I have never watched as many movies in theaters in such a short period of time as I did to catch as many of the Oscar nominees on the big screen. 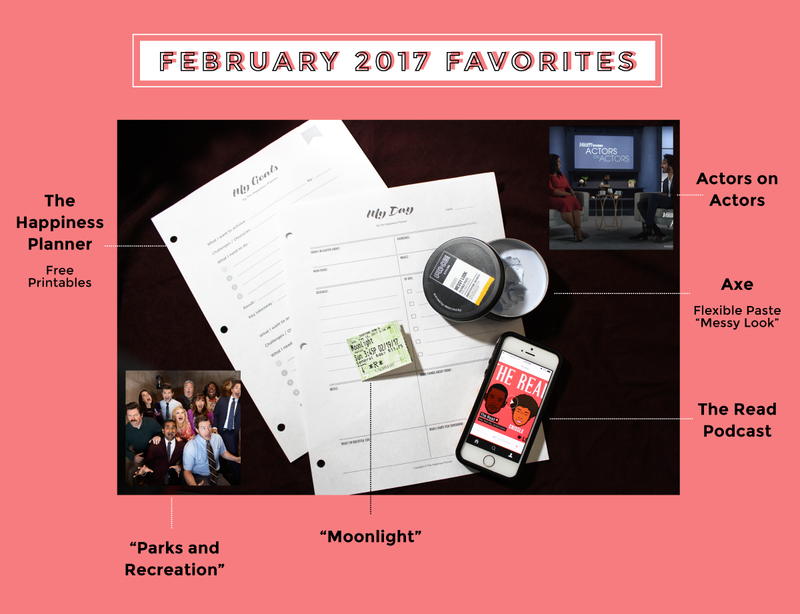 I’ll be sharing what I’ve been loving this month (as well as my personal Oscar choice)! I recently finished this hilarious and heartwarming series, thanks to the persistence of one of my best friends. Pretty much all the characters have a special place in my heart, especially after seeing the character development of the great Ron Swanson and stubborn April Ludgate. For those who don’t know the plot, the show follows Leslie Knope, an incredibly dedicated and optimistic deputy director of the Parks Department in the fictional Pawnee, Indiana in a documentary style of filming. We follow her and the rest of the staff in the department on their chaotic, wild adventures while trying to please the citizens of Pawnee. Each character is so unique and distinct, and as an ensemble cast, creates the comedic genius of the show. If you’re looking for a light hearted, quirky comedy series, I highly recommend it while it’s still on Netflix! While designing graphics for several hours a day at my internship, I have a lot of time to myself. Only recently did I realize how much time I wasted before discovering podcasts. The Read is one of my first podcasts, after listening to the fictional drama series Lime Town. The Read is incredibly entertaining and hilarious due to the talents of Kid Fury and Crissle, who discuss several different topics in their hour and a half long weekly podcasts. I love it because of their charismatic, electric personalities and that they touch upon topics ranging from Black Excellence, pop culture, current events, and fan letters with a social justice lens. Whether you have a desk job, plan to go on a stroll, or want to be entertained but also enlightened, check out The Read! During February, I was getting restless that all my creative ideas were jumbled and piling up in my mind. And staying there. I realized I was most productive when I had an organization system with written tasks so I can visually see what I need to do to accomplish something. I tried out the Passion Planner last year and that was great, but I wanted to try a new format this year. After researching a few different free templates online, I came upon The Happiness Planner (which I remember Jenn Im of Clothes Encounters fondly sharing on her own channel). I appreciated that they had several free printable PDFs for those who want to test out their organization system. The sheet I frequently use is the “My Day” planner. I actually prefer that the “Schedule” and “To Do” sections are separated because it keeps my daily activities on one side while actual tasks are on the other (plus I feel accomplished every time I get to check off a box)! I also find the small sections to write out what you’re excited about, good things that happened that day, what you’re grateful for and what you hope for tomorrow are beneficial for boosting self-love and appreciation. I personally find writing therapeutic and healing, so for those who are too busy to commit to a journal, having a space to quickly jot down positives in their life can help one’s mental and emotional health in the long run. This year one of my best friends and fellow cinephile made it our goal to watch as many of the Oscar nominees for best picture. Moonlight was our only “must watch” of the whole lot, and for reason we would realize after experiencing this beautiful story of struggle. I’ve been reading so much interest and love on social media about this story, and knowing the basic plot, I just knew I had to experience it myself, and soon. I was so emotionally immersed in the protagonist’s struggles from the very beginning until the last scene before it faded to black. Everything was heartbreakingly beautiful, from the gorgeous cinematography and lighting, to the incredible cast, and most of all the screenplay, a story of a black man in poverty and an environment riddled with drug abuse, suffocated by his internal struggle of sexuality in a space and time where masculinity has only one mask. The film follows Chiron, the lead, at three different pivotal ages and shares an intimate look into his self-discovery of his sexuality and daily struggles over his intersecting identities. There were several scenes that broke my heart as well as root for his successes and triumphs. I could go on, but I hope you get a chance to experience this amazing story for yourself. It is important because this story does not always get the opportunity to be on the big screen to represent the black and LGBTQIA community for such a number of viewers, let alone win an Oscar for best picture. The story and its Oscar win is symbolic and a small triumph for those whose story is similar to Chiron’s. Ever since getting my hair cut short into a combover/short pixie, I’ve been testing out different hair styling products to slick my bangs back. After living off of samples, I finally decided to try out a fairly affordable styling product to try out. I was with one of my friends on our usual Target date (because of course Target is the perfect location for dates, platonic or romantic), and I was on the lookout for a hair product. He suggested his usual Axe styling paste and I decided to give it a try. For $7 it wasn’t a steep commitment, and on occasions I prefer a more flexible, not sticky, fragrant free hair style, I find myself reaching for this over my LUSH Dirty Styling Cream. Don’t get me wrong, I love ‘em both. They just give me a different feel, but in the end I result with a hairstyle that will stay in place, even until the next day. During Oscar season, I wasn’t just keeping up with the films in theater but also the actors’ perspectives on their roles and other actors’ as well. My friend (the same one who suggested the Axe styling paste), reminded me about the Actors on Actors series by Variety on Youtube and I found myself bingeing interviews for a few nights (shamelessly, of course). It was a refreshing change to see actors interview other actors, asking questions regarding the art of acting and storytelling through film that they both found more substantial than the typical cookie cutter interviewer who asks surface level questions. My personal favorites? Dev Patel & Octavia Spencer, Viola Davis & Tom Hanks, Hailee Steinfeld & Sally Field, Taraji P. Henson & Ryan Reynolds, and Greta Gerwig & Mahershala Ali.